Joe Anderson's outside-the-box thinking finally paid off. The wide receiver was signed to the New York Jets' practice squad Tuesday, about six weeks after he stood outside the Houston Texans' stadium for a few days with a sign asking for an NFL job. Anderson posted a picture of himself holding a piece of cardboard box with the words "Not homeless ... but STARVING for success" on Instagram that quickly went viral. He also wrote on the sign in black marker: "Will Run Routes 4 Food" and added the hashtags: Whateverittakes, UnderDog, Hungry and IBelieve. 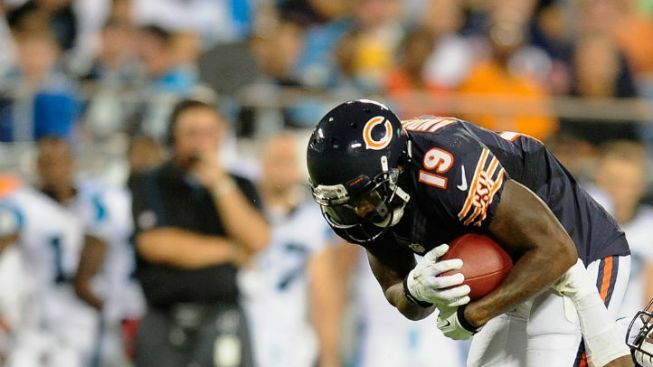 He practiced with the Jets on Tuesday, rejoining former Chicago teammate and fellow wide receiver Brandon Marshall. Anderson was signed by the Bears as an undrafted free agent out of Texas Southern in 2012 and played in nine games, mostly on special teams, for parts of two seasons. His 2013 season ended with an abdominal and groin injury that landed him on injured reserve and he was later waived. He was with Philadelphia in the 2014 offseason and spent time in the CFL, but had been out of a job in football this season. Anderson took a desperate and creative approach for looking for a new employer by hitting the streets. He stood outside the Texans' facility at NRG Stadium in Houston and held up his sign for everyone to see. "Lord it's all in your hands," he wrote on Instagram last month in his caption to the photo. "All I know is that I believe it by faith and see it all happening even when it looks like a joke before the eyes of man!" The married father of two added that it was not a publicity stunt, but he was doing it to fulfill a dream and to inspire others to do the same. "It's bigger than just collecting a check to me, straight up!" Anderson wrote. "The way I do what I do and why I do what I do isn't just to score touchdowns and gain fame. That's far from the case. I don't need all that 'cause I'm already famous in spirit and you can't get no (more) famous than that. When I get my shot, you'll see what the Lord is truly about to do in my life and I pray with all my heart it inspires you to never give up." Marshall saw the post last month and was moved by Anderson's actions. "Wow, this is humility right here," Marshall wrote on Instagram. He added that Anderson was "one of the hardest-working guys I've had the pleasure of playing with" while they were with the Bears. "Some may call him #crazy," Marshall wrote. "Hell, I had to stop and really see his strength in this. I watched this guy grow so much. JOE you're the kinda of guy I want to play with. You're the guy I want in my FOXHOLE. I don't care if it's covering kicks. #mindovermatter." Anderson, 27, played at Louisiana Tech before transferring to Texas Southern and playing for three years there while recording 154 catches for 2,010 yards and 13 touchdowns. As a rookie with the Bears in 2012, he had three special teams tackles in the final three games of the season. He had another special teams tackle the next season in six games, and returned five kicks for 82 yards.